I didn't post the press release below when it first came out because it's propaganda of the highest order. The state's prosecutors are all just trying to justify their mandatory minimums and derail any efforts at sentencing and prison reform this year. 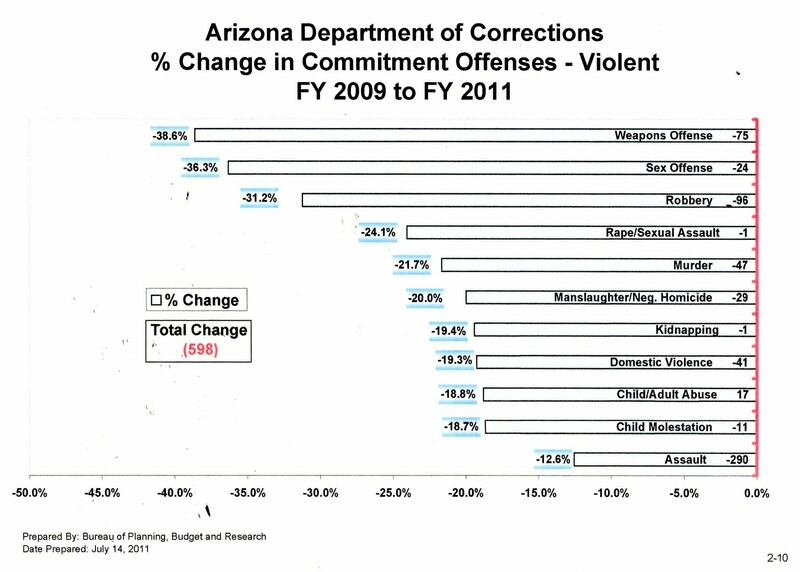 The AZ Department of Corrections own data shows that there's been a decrease, not an increase, in the violent criminals they've been committing in the past two years - it's not an inherently more violent population of prisoners - it's a more abusive and neglectful administration. 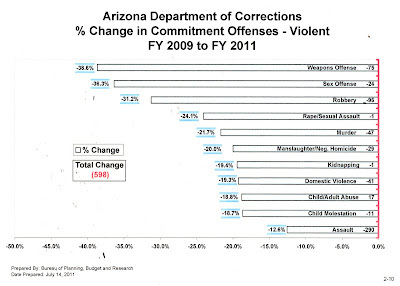 decrease in committed violent offenders 2009-2011, from their annual report. Fischer's last report for the state prosecutors association (Prisoners in Arizona: A Profile of the Inmate Population) was a huge distortion to manipulate the public's fears, too (here's the PR campaign that went with that one, and the excellent, detailed report put out by AZ Attorneys for Criminal Justice disputing it). Deception seems to be the only way the state prosecutors association can make it's case, which means they don't have much of one to begin with. Here are minutes to the 2010 AZ House Committee on Sentencing Reform where Professor Mona Lynch - also an "expert" on criminal justice in Arizona - takes that report apart. This interview on KJZZ about the more recent report - with criminologist Franklin Zimring, Bill Montgomery and Sheila Polk - is pretty interesting. Zimring's done a lot of research on the claims the prosecutors assert himself, and dispels many of the myths this kind of thing perpetuates. Speaking of truth-in-sentencing and our tough state prosecutors, check out how seriously Barbara LaWall's office (Pima County Attorney) takes sexual abuse of children when perpetrated by corrections' officers...How is it "truth-in-sentencing" when double standards for law enforcement officers remain?